It was just several years ago that Syria was helping refugees from the fighting in Iraq. Now it is Syrians taking refuge in Iraq and other countries as the war between rebels and President Assad’s forces continues. Syrians are fleeing daily to Iraq, Lebanon, Turkey, Egypt, and Jordan. Not only do they have to fight hunger but also cold weather. The United Nations High Commission for Refugees is trying to provide shelter, blankets, and clothing for the refugees. This has not been an easy task with hundreds of thousands of Syrians in need and funding low. This month storms hit the Zaatari camp, flooding and blowing over tents. Syrians who had just gone through the trauma of being displaced from their homeland were dealt another blow. Conditions will continue to be tough for the coming winter months. 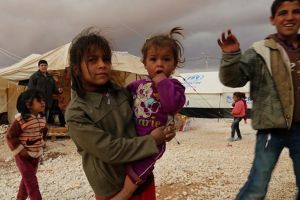 Laure Chadraoui, a spokesperson for the UN World Food Programme in Jordan (WFP), said, “The temperature drops here as low as minus two or minus three [Celsius] sometimes, especially at night.” WFP gives food aid to the refugees. WFP says it might need to feed 750,000 Syrians refugees this year. Meanwhile, inside Syria WFP is feeding about 1.5 million victims trapped by the fighting. This mission is made more difficult by the ongoing violence but also by funding difficulties. Aid agencies like the UN World Food Programme (WFP) and UNICEF will need funding to help Yemen fight off the hunger crisis. These agencies rely on donor governments and the public. The U.S. Food for Peace program is the largest single supporter of WFP. If the U.S. Congress supports Food for Peace in upcoming budget negotiations, it can lead to more donations to fight hunger in Yemen and elsewhere. Humanitarian aid is a crucial part of achieving peace and stability whether in Syria or Yemen. Article first published as Millions of Syrians and Yemenis Suffer from Hunger, Cold on Blogcritics.